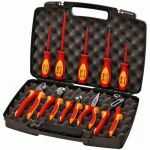 This 9 piece set features an assortment of popular nut driver sizes. 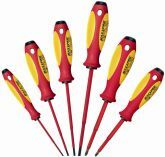 Each are individually tested to exceeed the IEC 60900 and ASTM F1505 standards for insulated tools. The highly durable, black nylon case features a zipper closure, custom-fitted tool pockets plus an extra pocket for storage of papers and other items.